During the Victorian era William Sugg & Co Ltd became arguably the most important manufacturer of gas lighting in the world. Thomas Sugg, an ironmonger, is credited with “making and laying” the first gas pipe which was used for the first demonstration of gas lighting in London in 1807. His son, William, formed William Sugg & Co in 1837 and his son, William Thomas, became the driving force after his father’s death in 1860 right through to 1907. 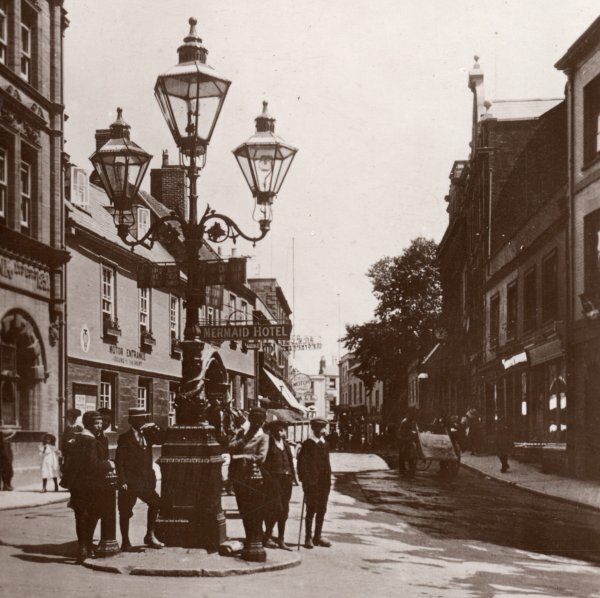 In 1887 a triple-head 'Lambeth' pattern street lamp by William Sugg & Co was donated to the town by the Gas and Coke Company to mark the Golden Jubilee of Queen Victoria. It was erected at the junction of High Street, Hendford and Princes Street as seen in the first two photographs below. Around this time other towns were beginning to be lit by electricity but the presentation to the town of this celebrated style of gas lamp was something of a public relations coup by the gas company. By 1925 two of the lights had been broken and the whole construction was removed in the early 1930's. Another of Sugg's triple-head 'Lambeth' pattern street lamps was installed in the Triangle but removed when the public underground toilets were built. This site is now occupied by the bandstand. 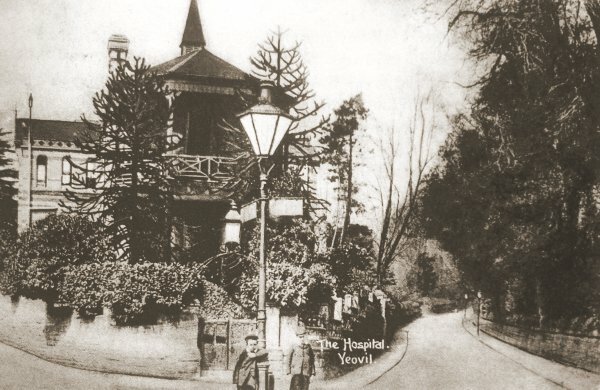 A single lamp 'Lambeth' pattern street lamp was installed on a small traffic island outside the Fernleigh Hotel at the junction of Lower Middle Street with Station Road, but was removed in 1913 when Central Road was built. Another single lamp 'Lambeth' pattern street lamp was installed at Fiveways, outside the hospital, and was even used to hang traffic direction signs from as seen in the photograph below. A further single lamp was installed at Townsend, at the junction of London Road (Sherborne Road) and Reckleford. The lamps were so large because the soft solder used to join the metal elements together would have melted on a smaller lantern with the heat generated by the gas flame. Today Sugg lamps may be seen outside the Houses of Parliament in London as well as by other London landmarks. This photograph, from around 1910, gives a really good indication of just how large Sugg lamps were. Nice to see that even before my time lads used to hang around on street corners. Mind you, I don't think that even if I was around in 1910 I would have worn a boater and plus fours, let alone sport a cane. 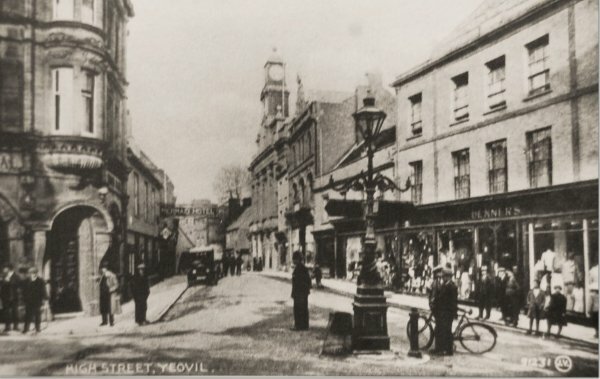 A postcard dated 1904 showing High Street as seen from Hendford. 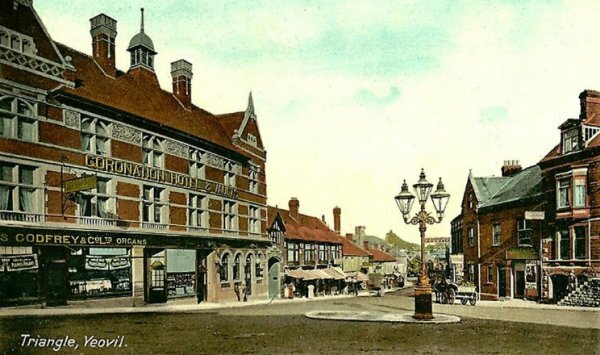 Even at this time High Street was also known as The Borough. 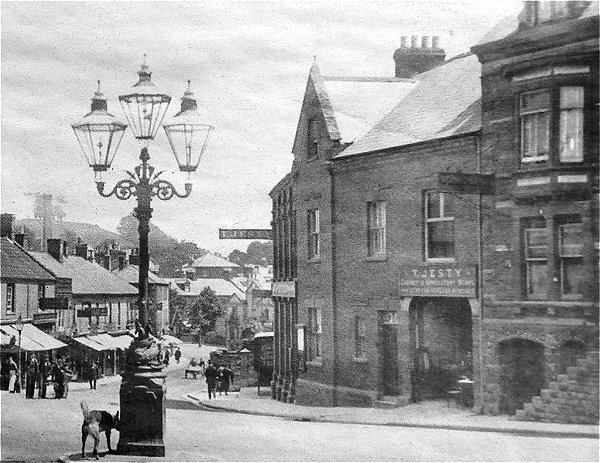 The three-lamp 'Sugg Lamp' was donated to the town in 1887 by the Gas and Coke Company to mark the Golden Jubilee of Queen Victoria. the lamp was removed in 1928. A postcard dated 1925 of the same view, but notice that two of the Sugg lanterns have disappeared. They effectively became old fashioned after electric street lighting was first installed. The Sugg lamp was removed completely very shortly after this photograph was taken. 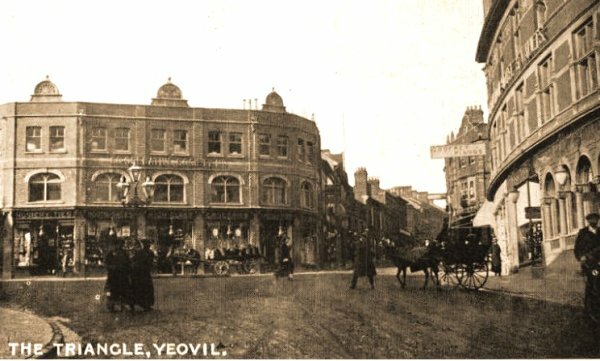 A hand-coloured postcard dating to 1905 and looks down Middle Street from the Triangle. 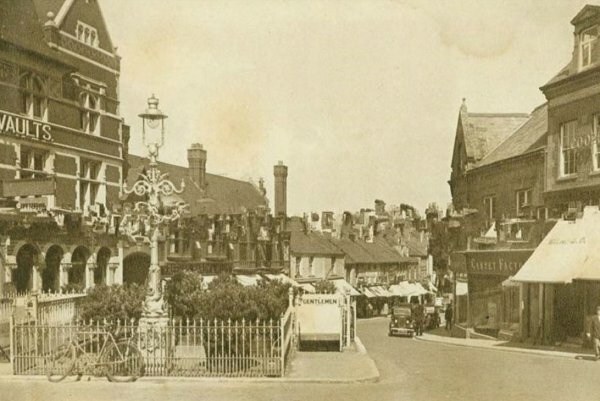 At left is the Coronation Hotel and Vaults and to the right is the large triple-head Sugg gas lamp which was incorporated within the iron railings surrounding the underground toilets when they were built in the mid-1920s- the location is now the bandstand. A nice photograph of the triple head Sugg lamp (with suspicious-looking dog), in the Triangle outside the workshop end of Thomas Jesty's store, photographed around 1905. Looking west, this postcard dates to 1912 and shows the area of the Triangle completely free of obstructions. Note the triple-head Sugg lamp to the left. 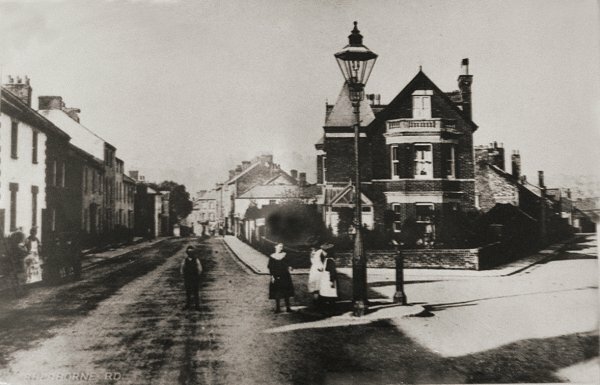 This photograph dates to 1903 and shows the single lamp 'Lambeth' pattern Sugg street lamp that was installed on a small traffic island outside the Fernleigh Hotel, at the junction of Lower Middle Street with Station Road, but was removed in 1913 when Central Road was built. This postcard of about 1900 shows another single lamp 'Lambeth' pattern Sugg street lamp installed at Fiveways, outside the hospital, and was even used to hang traffic direction signs from. This is probably the earliest photograph of Townsend and dates to about 1890. It is taken from Sherborne Road with that part of the old London Road, known as Townsend, running off to the left and Reckleford runs off to the right. 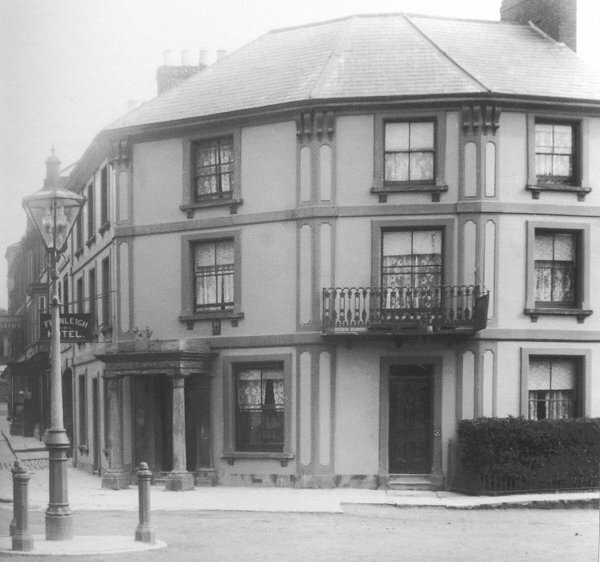 This view is completely unrecogniseable today with the large house on the corner now the site of gardens, pedestrian walkways and traffic lights, while the row of houses at left were demolished in the 1970s. The triple-head Sugg lamp in the Triangle was replaced in the mid-1920s by a single 'Upright Rochester' pattern Sugg lamp, seen in this photograph (and by this time enclosed by the railings of the new underground toilets). The same happened at the junction of High Street and Princes Street. Many thanks to Chris Sugg for informing me that the lamp in this photograph was an original 'shadowless' Upright Rochester fixture designed by the Sugg company as an improvement on the lanterns with frames that threw shadows. This photograph is from Chris Sugg's collection and gives a very good impression of just how large the Sugg 'Lambeth' pattern lights were (unless, of course, the chap in the photo was vertically challenged). The lamps were so large because the soft solder used to join the metal elements together would have melted on a smaller lantern with the heat generated by the gas flame. 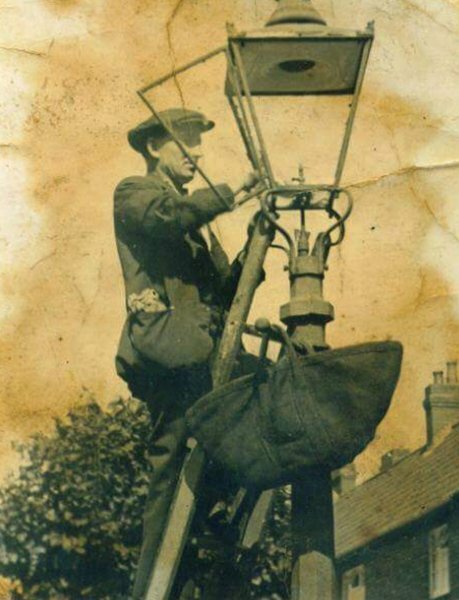 Sonja's granddad Fred Butts, who died in the late 1960s, carrying out maintenance on a Yeovil gas streetlight. 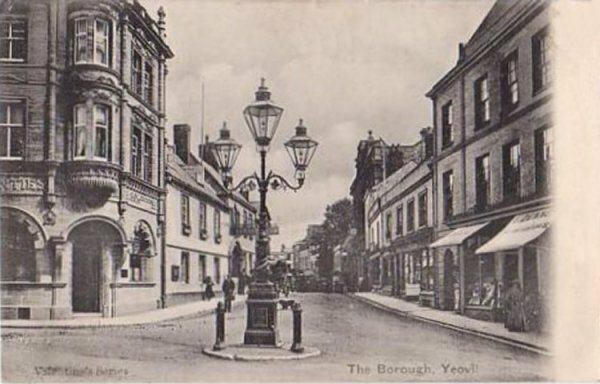 His obituary said he was one of the last gas lamp lighters in Yeovil. 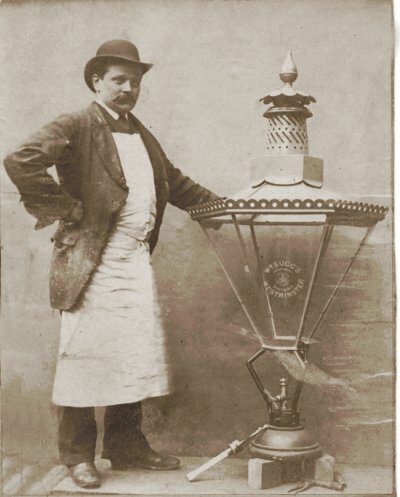 A lamplighter was a person employed, usually by the local gas company, to light and maintain street lights. Every evening the lamplighter would come along on his bicycle to light the street lamps, carrying his ladder on his shoulder. It was a wooden ladder, usually tapered to a point at the top. He also carried a pole with a spirit lamp and hook at the top. There were bars near the tops of the street lights for the lamplighter to lean his ladder against. The lamplighter only needed the ladder occasionally when the lamp didn't light at the first bidding. If it worked fine, he did everything from pavement level; if it didn't, he needed the ladder for closer inspection or maintenance such as changing the mantles, cleaning the glass, etc. He would insert the pole into the vent at the bottom of the glass case and the gas supply was turned on and off by pulling on one of the two chains by the mantles with the hook on the pole. He then used the spirit lamp to light the gas. There were between one and six mantles in each lamp. The lamplighter would return each morning to put them out using the small hook on the pole to turn off the gas.